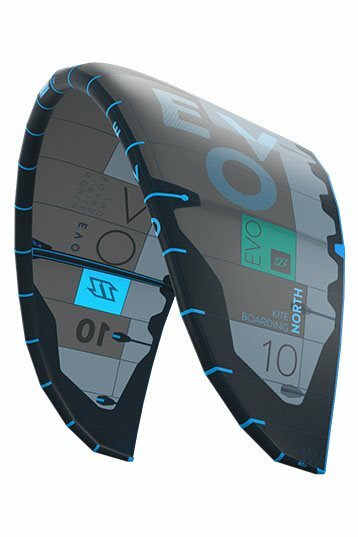 The Evo is the ultimate all round kite in the North Kiteboarding range and a completely new interpretation of a freestyle/freeride kite. The Evo is at home no matter what the conditions. Tom Hebert competes in wave and freestyle events, as well as freeriding all over the world on trips. He choses the Evo as his kite, knowing that no matter where he is, or what type of riding he is doing the Evo will deliver. The kite can be flown on 4 or 5 lines and feels like an easy to use C-Shaped kite in terms of its handling. It has a smooth predictable nature and direct and responsive turning characteristics. The hangtime and lift delivered when jumping is impressive, the kite really accelerates through the window to generate huge amounts of power and lift, perfect for oldschoool manoeuvres. Kiteloops feel extremely smooth, the Evo catches the rider gently after the loop. 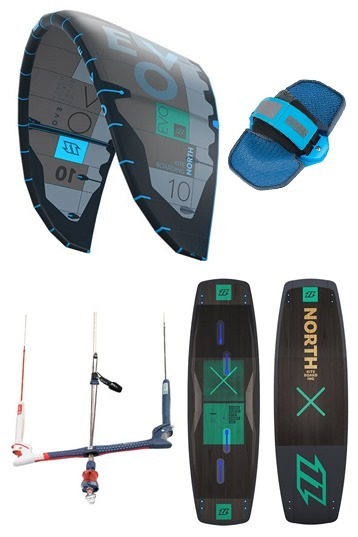 It is exceedingly stable in the air, making it great for freestyle and waves too. Hooked or unhooked the Evo responds perfectly to rider input on the bar in a predictable manner. Due to the 5 struts, the Evo is stable even in biggest gusts or steering mistakes. Ride the Evo for years now. Actually, I grow up with this kite. Had lessons with the Evo 2008 when it was a beginner kite. Kites evolve and I grew up with it. The last serie is a high end kite. I take the 12m in light wind but I think a 14 was better. The 9 in 5 bft until a big 6bft. Here lies the strength of this Evo. Big jumps, easy upwind, big jumps, easy upwind. Enjoy! I tested the Evo 8m² in Tarifa in different conditions. I tested with the 5th line bar. And I really love agile kites. First of all, the orange/red design is really hot! It reacts fast and directly, generates speed and you can really boost some nice airs. I like to carve in the waves, and this is, what you really can do with the 8m² Evo. The power it delivers is easy to control, the kite also drifts nice in the wide carved turns, or even when you go down the line. Not as much drift as the Dice, which I tested in 7 and 9, but surely enough, if you move the kite a little. The Evo is a good compromise for Freeride / Oldschool and Wave. I haven't tried unhooked yet. If you have the chance to test it, do it! For our school, we tested the Evo next to the Neo 2014. First, we tested them in low wind. The Neo had a better low end, more feedback and power. We thought we would go for the Neo. But the big question was how would the Neo reacts in more wind. Is the power still controllable? Well, we found out in moderate winds that the new Neo is pretty strong. Generates a constant grunt (pull) with a pretty gradual but strong lift and boost. Something its great for a good all rounder but can be scary for a beginner. For a starter kite you like a kite with good feedback & power control on the edge of the wind window (Evo cons light wind, pros in moderate wind). The Evo is a higher aspect ratio kite. It generates power in its flight lines, that means you need a bit more kite feel and control than a sheet and go kite as the new Neo. Kite feel is what lacks most of the beginners, so we prefer the Neo for starters. 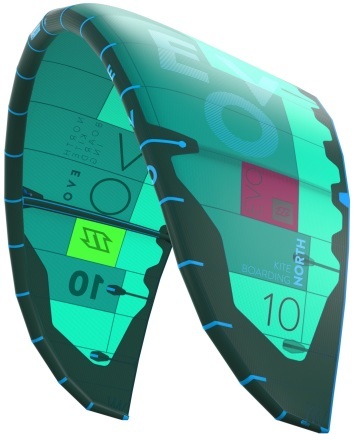 The Neo had the better stability, feedback and ease of control in light wind. But if the wind picks up we will changed the kites earlier to the 7m sizes! Don't throw the Evo away, this kite is great for moderate and high winds jumps. Especially for more experienced & light weight riders. For the kiteschool we just tested the new Neo and Evo 9m in underpowered conditions. This size we use a lot and a 9m or 10m kite is mostly the first kite size people buy in our region. Last season we had the Neo but we got a hint about the new Evo so we started a comparison. The Evo is a higher aspect kite than the Neo, that makes the Evo a little bit less stable with less power on the edge of the wind window. The feedback & low-end of the Neo is better. So for the lighter wind conditions we still go for the Neo but how will the Neo 9m perform with more wind? Soft or a more explosive power? How long will the Neo hold its total depower (bar away power gone) comparable with the Evo? We have not tested it yet in those conditions. If so, we will leave a small test behind. How does it compare to the Fuse? Hi Gavin, it flies pretty much the same as the Fuse 2013. How does it behaves when unhooking? I like to do some unhooked rolls and spins, nothing to fancy. Does the bar pressure becomes to much like it did on the 2011 evo? The Evo is playful and powerful, The hang time is increased and great for old school, what you notice is that the drag is less then before. So staying upwind is easier and the low end is better. Overall a great kite, the only thing... it's difficult now to make a choice between the great Dice and new Evo :). For an all-round kite, orientated at free ride and freestyle, the best choise. Personally I thinks it's my kite for the season, great hang time, all-round & playful.